Outside the face is a red border framing her. The red is wider at the bottom. It’s time for women to stop being politely angry. I will take a screenshot at 99% battery and next to it is Mon 10:08PM. I will post the screenshot underneath this line so you can see It and Her. interpret that anyway you want. the Coming to the Table exhibition organized by Association of Hysteric Curators (AHC). This work is continuing as Document 7. I decided It after I wrote the last sentence above. It is on the left side of Her. Above Her is now 100% battery Mon 10:36PM Christine…e Guiyangco. I will take a screenshot at 100% battery and next to it is Mon 10:36PM. I took another screenshot as an image I will submit for ourprimeproperty.org. Her is Who does she think she is? It is Who does it think it is? Her is It’s time for women to stop being politely angry. It is It’s time for it to stop being politely angry. Her is an image of a face. It is an image of a Her face next to It. Her is an image made by a woman. It is an image made by a woman. Her is an image made by an artist. It is an image made by an artist. 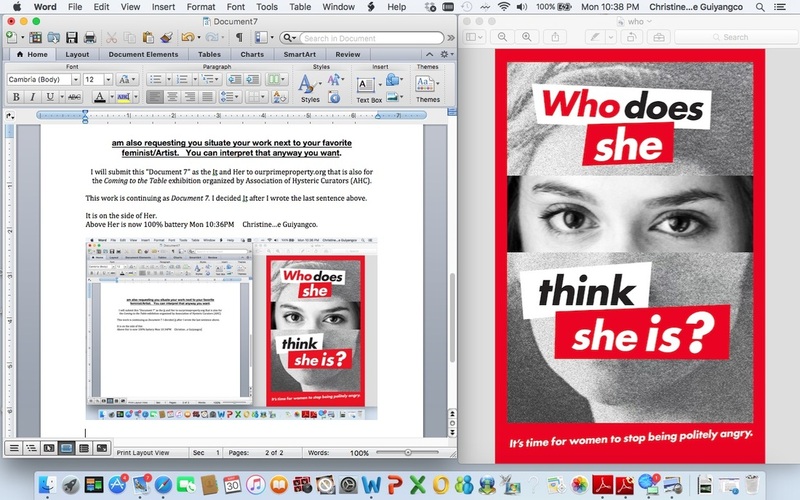 Her is an image made by Barbara Kruger. It is an image made by Christine Dianne Guiyangco. Her is by “Barbara Kruger (born January 26, 1945)”—from Wikipedia. It is by Christine Dianne Guiyangco born April 8, 1992. Her is American New Jersey United States. It is Filipino Luzon Philippines. Her is a googled image after typing “Barbara Kruger”. It is made after Her googled Word opened Document 7 seen then Document 7 written. Her is then made by It next to it. It is then made by Her next to her to exist here on ourprimeproperty.org in association with Coming to the Table exhibition organized by Association of Hysteric Curators. Christine Dianne Guiyangco is a Los Angeles-based artist. She was born in the Philippines in 1992 and moved to the United States in 2001. Guiyangco actively works in a range of fields including performance, painting, writing, installation, video, and sculpture. She has exhibited in Space B Gallery, PØST Gallery, UCLA Hillel, New Wight Gallery, and Charlie James Gallery. In 2014, she graduated with a Bachelor of Arts at the University of California Los Angeles. While studying at UCLA, she was the recipient of UCLA Art Council Undergrad Project Award four times, the Resnick Scholarship Award 2012 to 2014, and was selected by the Department of Art faculty to be the 2013-14 Department of Art Undergraduate Representative.